Update: For the past year, I have been trying to find a property that would be a good physical home for The Walking Gallery of Healthcare. There we could host art classes for all ages, artists could paint jackets, and patients from around the world could visit us in peaceful Grantsville, Maryland. The red brick house (red brick is great for mural painting) next to mine became available and I put in an offer. The contract was accepted!!! We need to close by February 19, 2016. Then I must begin needed repairs to the furnace and plumbing. I hope to have the space ready to have a public dedication on Thursday, May 19, 2016 at Cinderblocks3. My son Isaac thinks we should call the art center Salt and Pepper Studios, since salt is used in medicine and a little pepper is what makes health activists great. Thank you CANCER101 and so many others for supporting this project so far! I will keep you posted as we go forward. Some folks have had a few questions about the new art center. Though I do not do list posts very often, I thought this would be the easiest way to explain why we need to create this center. 10. People need space to create. 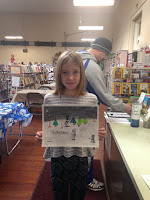 I have worked with the students in every class in Grantsville Elementary School as they created art for the Grantsville Art Walk. That is 220 some children working on art. The last time I assembled this many class creations, I lived in a small apartment in Washington, DC. I can tell you from experience that doing large quantities of art in small spaces is very stressful on the artist and their family. We need space to create. We need rooms that can get messy and we can just shut the door. We need a place to put our tools. We need to be able to share those tools, because art can get very expensive and out of the economic reach if you have to buy everything for personal use. 9. Painting can be very lonely. 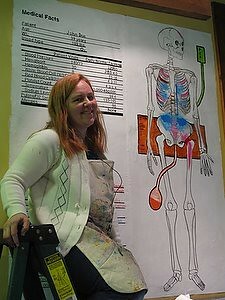 You might have seen me painting at medical conferences around the world. I am usually set up off to the side. During every break the wonderful attendees come over to my easel. We talk about their personal health stories and the power of art to heal. The most important thing is: we talk. Some people have noticed I do not paint Walking Gallery jackets as quickly when I am at home. There is a very good reason for that. At home, I paint alone. I trudge down to my basement studio and paint for hours. Some artists may like this solitude, but I do not. If I didn’t have the ability to listen to WAMU/NPR out of Washington or WFRB broadcasting from Finzel, I am not sure could complete my work. I look forward with glee to the point when the painting is finished and I can get on Facebook and Twitter to post the pictures and “talk” with people again! Then I look over at the next jacket. I pin it to its painting form. I begin the process of priming it and painting alone. When my loving husband Fred was dying he worried. He told me, “Reggie, you are going to be alone. We both know you are not good at being alone.” He is right. Fred and I met 22 years ago in a painting class. We were both sad and lost and we found each other. We were never alone surrounded by stories, paint and each other. Now he is gone and our sons remain. Each day I work very hard at painting our family ever larger. That family is The Walking Gallery and that family needs a home. We need a place that artists from all over America can come and paint together. A place where we can support and inspire each other. If we want this movement to grow from hundreds to thousands of jackets, we need a place where we can paint and grow this movement. 8. Children need to see the arts as highly valued in our society. The children are watching. They are amazing information sponges. They see that in school they have math and reading everyday but may only get art once a week. Or perhaps they must choose. They can take an art class or a music class or band, but not all three. They can see that a town or a county will spend thousands on a soccer field, tennis courts and baseball diamonds, but not invest in outdoor easels and public art. I know that art is the driving force that helped me through a very hard childhood. I know having the opportunity to draw a picture and act in a play made all the difference in my life. I know that I attended school and stayed in school because I loved my art class and my debate class. We need places like this art center, shining like a beacon of hope and creativity because people will see it and the children are watching. 7. We need a culture of healing in healthcare and not just a sickness model. When I begin to explain what I do, people often interrupt with the question, “So are you an art therapist?” I explain no. Art therapy is great and art has so much power to heal. But I use art in a way that goes beyond the therapeutic goal. I use art to share stories. 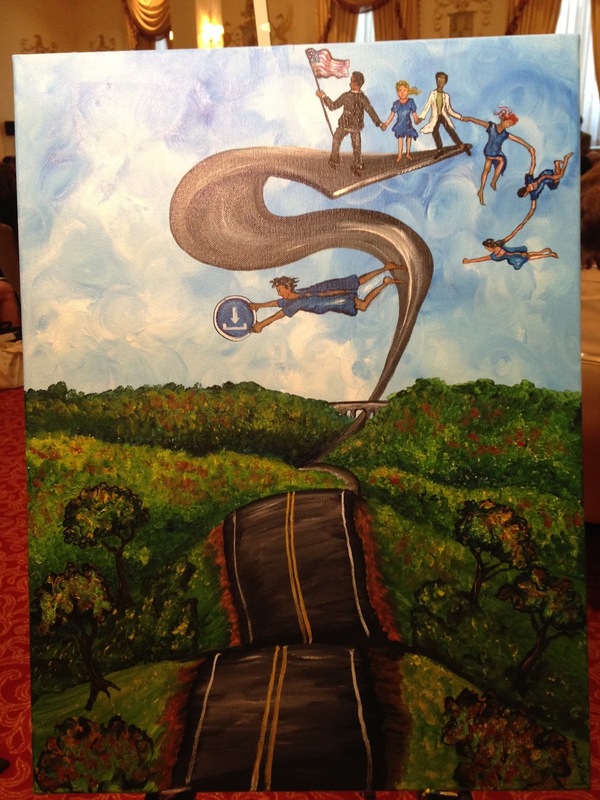 I use art to create public policies that are patient centric and I focus my art on the world of healthcare. So this really edgy concept of hospitals embracing the arts is becoming mainstream. Now let’s do something really innovative; let’s build an art center that embraces medicine. 6. Communities need a place to congregate that is not centered on eating. For many years my family lived in a small apartment and it would often get very claustrophobic. On nice days we could go to the park, but in winter the options were few and far between. We could go to stores and spend money that we could scarce afford or we could go out to eat. The problem with frequently going out to eat is that the caloric load is very high, especially in the types of food establishments a poor family can afford. As a person who is very plump, I try to find public events and venues that allow congregation, but are not centered on food. Art classes, health workshops and family game nights are all wonderful ways to utilize our future center without adding to the national obesity crisis. 5. We can do great things by crowdfunding in healthcare. I go into way too many meetings where people tell me the good ideas they envision to help others cannot be realized. They do not have the funding. I reply, have you tried crowdfunding? At this point with the help of the crowd, we have created patient travel scholarships, a video on how to join the Walking Gallery and help pay for our first Partnership with Patients conference: #Cinderblocks. 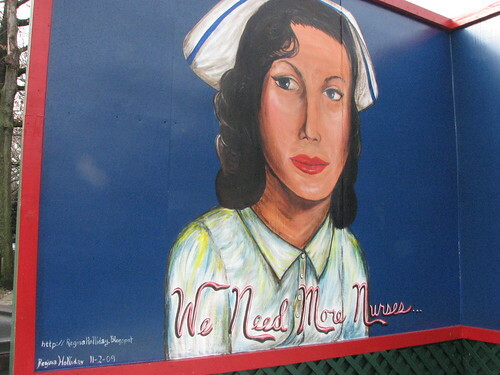 This project is part of a current crowdfund campaign on gofundme: The Walking Gallery We already have raised money towards the down payment on this building on Medstartr and now are gathering the funds to make needed repairs after closing, insurance for the building and any offsite events, and this fund helps pay for the paint and shipping cost associated with the Walking Gallery. 4. Creative Placemaking is really happening, check it out! In September 2014, I was able to attend a Creative Placemaking Summit in Cumberland, Maryland hosted by the Allegany Arts Council. Across the nation hacker spaces, maker spaces and art bars are cropping up. In Garret County we already have a business incubator hub in McHenry and a maker space in Accident. 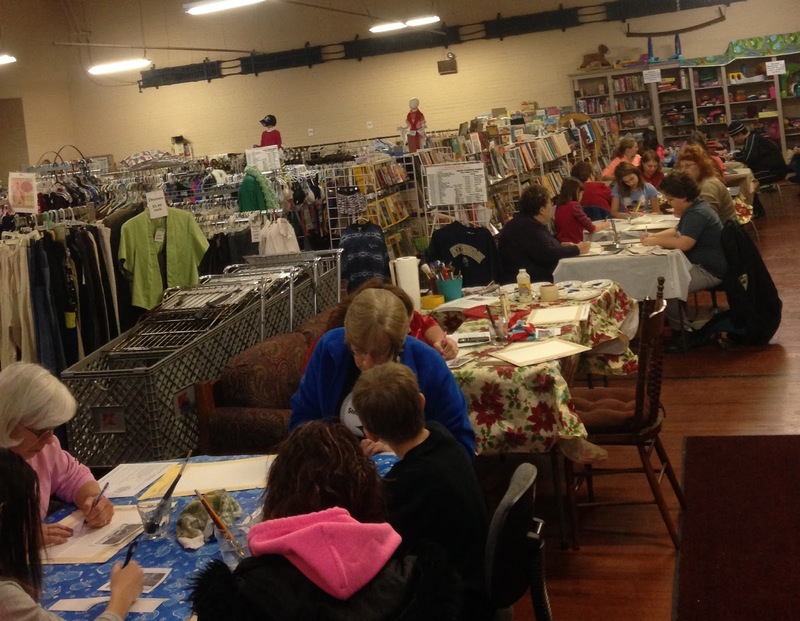 It just makes economic and geographic sense to have an Arts Center in Grantsville. In July 2015, Grantsville became the site of the first Arts and Entertainment District in Garrett County. My work with the students of the local school, hosting #Cinderblocks2 here and creating pieces of neighborhood art, helped ensure this designation. 3. You can’t build an international movement without wifi. The town is also wired for high-speed internet through Comcast cables. Now for many of my readers who live in big cities that may not seem very important, but in this mostly rural area it is a very big deal indeed. Many of our geographically close neighbors have to deal with the frequent outages of satellite internet. We can provide the community a space that is so very needed in this day and age. This space can also be the command center as we plan #Cinderblocks3The Partnership with Patients Continues. (You can register here!) #Cinderblocks3 will bring 170 people to Grantsville in late May of 2016. We hope to make it an annual tradition, a sort of Burning Man meets Healthcare. 2. Some of us need a safe place to go. For many years I suffered abuse as a child. I would not often talk about it, but I wrote about it and I drew about it. I hoped my teachers would act, but they never did in an obvious way. That was another time and another place. Today we are supposed help those who are in abusive situations. Sometimes you can even prevent some abuse through better use of space and free time. It is very hard for a family to be stuck in a small space in a long winter. It helps if there is a safe place that you can go and play. In addition, throughout this past year many patients and artists have reached me. They have asked for help. They need a place to stay; they need a place to heal. They need the mentorship of a strong advocate and the embrace of a loving community. That place can be this center. 1. I am rooted here. I have lived in so many places in my long and winding life. We always rented; we always moved. The Uhaul truck became a familiar friend. 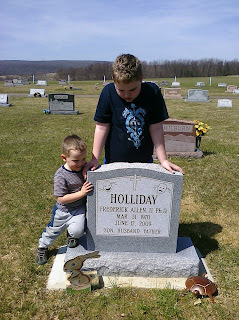 In 2009, my husband Fred died and was buried here in Grantsville. Our children place toys upon his grave. He lies two blocks from our home, three blocks from our Church and four blocks from his parent’s house. He walks with us in spirit. People ask me, “Why create a home for the Walking Gallery in Grantsville, Maryland?" I say because this place is quiet, kind and peaceful. This town can help others as visitors can help Grantsville continue to thrive. 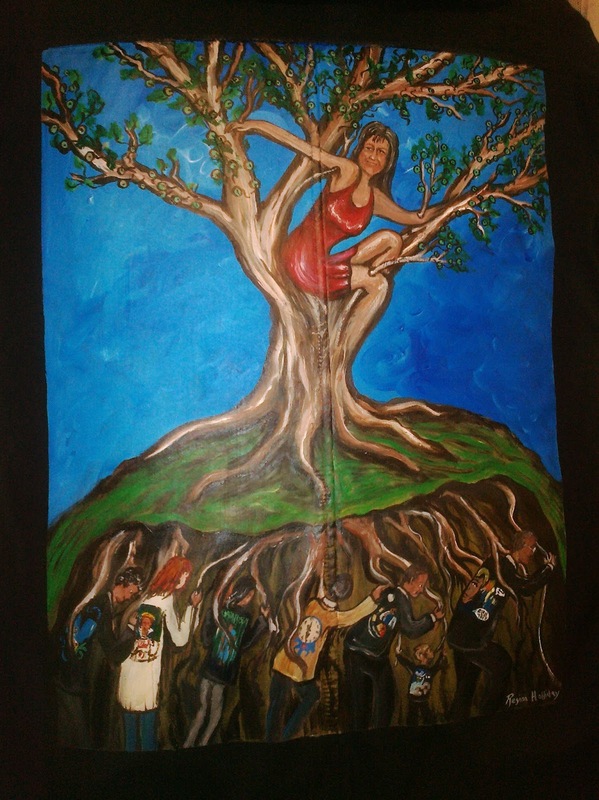 But most of all because I founded The Walking Gallery of Healthcare. The Gallery must grow, must walk; but I am its roots, and I am rooted here. Oh Regina, I'm praying and fundraising for this! I'm someone for whom the arts (visual arts and music) provided a much-needed refuge during childhood. Many years later, a psychoanalyst would observe that the artwork kept me alive. Didn't realize it then, now believe it to be true. As you know (because I've told you!) I started out as a visual artist before focusing on written expression -- a journey that's another story of healing. As for healing, I believe it's as much (if not more) of a spiritual process than it is a physical one in which the arts play a key role. My heart hurts whenever I hear someone say, "I can't draw." So f'ng what? Art is so much more than that. I know you know this and want to support you in helping others know it as well. Continue to be blessed and blessing, Regina. Thank you so much for your words of support during this very challenging campaign. I know this project is pretty unusual to many of our HIT brethren. I too have heard the I can't draw too many times and sorrow for the child that was shut down inside so many years ago. congratulations on achieving another milestone on your journey. Is there a place to send a contribution? Please let me know. When you are ready for a 2nd jacket, I can paint it for you. My thoughts are with you my friend. I am so glad we can make this a place of light and love again!